On 7 March 2009, two off-duty British soldiers of 38 Engineer Regiment were shot dead outside Massereene Barracks in Antrim town, Northern Ireland. Two other soldiers and two civilian delivery men were also shot and wounded during the attack. An Irish republican paramilitary group, the Real IRA, claimed responsibility. The shootings were the first British military fatalities in Northern Ireland since 1997. Two days later, the Continuity IRA shot dead a Police Service of Northern Ireland (PSNI) officer; the first Northern Ireland police officer to be killed by paramilitaries since 1998. From the late 1960s until the late 1990s, Northern Ireland underwent a conflict known as the Troubles, in which more than 3,500 people were killed. More than 700 of those killed were British military personnel, deployed as part of Operation Banner. The vast majority of these British military personnel were killed by the Provisional Irish Republican Army (IRA), which waged an armed campaign to force the British to negotiate a withdrawal from Northern Ireland. In 1997 the IRA called a final ceasefire and in 1998 the Good Friday Agreement was signed. This is widely seen as marking the end of the conflict. However, breakaway groups opposed to the ceasefire ("dissident Irish republicans") continued a low-level armed campaign against the British security forces in Northern Ireland (see Dissident Irish Republican campaign). The main group involved was an IRA splinter group known as the 'Real' IRA. In 2007, the British Army formally ended Operation Banner and greatly reduced its presence in Northern Ireland. The low-level 'dissident republican' campaign continued. 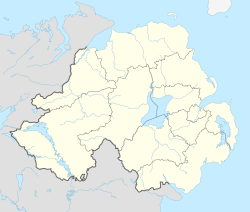 In January 2009, security forces had to defuse a bomb in Castlewellan, and in 2008 three separate incidents saw dissident republicans attempt to kill Police Service of Northern Ireland (PSNI) officers in Derry, Castlederg and Dungannon. In all three cases, PSNI officers were seriously wounded. Two of the attacks involved firearms while the other involved an under-car booby-trap bomb. At about 9.40 P.M. on the evening of Saturday of 7 March, four off-duty British soldiers of the Royal Engineers walked outside the barracks to receive a pizza delivery from two delivery men. As the exchange was taking place, two masked gunmen in a nearby car (a green Vauxhall Cavalier allegedly driven by Declan McGlinchey) opened fire with Romanian AKM automatic rifles. The firing lasted for more than 30 seconds with more than 60 shots being fired. After the initial burst of gunfire, the gunmen (allegedly Colin Duffy and Brian Shivers) walked over to the wounded soldiers lying on the ground and fired again at close range, killing two of them. Those killed were Sappers Mark Quinsey from Birmingham and Patrick Azimkar from London. The other two soldiers and two deliverymen were wounded. The soldiers were wearing desert fatigues and were to be deployed to Afghanistan the next day. A few hours later, the stolen car involved was found abandoned near Randalstown, eight miles from the barracks. A Dublin-based newspaper, the Sunday Tribune, received a phone call from a caller using a recognised Real IRA codeword. The caller claimed responsibility for the attack on behalf of the Real IRA, adding that the civilian pizza deliverymen were legitimate targets as they were "collaborating with the British by servicing them". The shootings were the first British military fatalities in Northern Ireland since Lance Bombardier Stephen Restorick was shot dead by the Provisional IRA in February 1997, during the Troubles. The attack came days after a suggestion by Northern Ireland's police chief, Sir Hugh Orde, that the likelihood of a "terrorist" attack in Northern Ireland was at its highest level for several years. Civilian security officers belonging to the Northern Ireland Security Guard Service were criticised for not opening fire during the incident, as a result of which plans were made to retrain and rearm them. The barracks were shut down in 2010 as part of the reduction of the British Army presence in Northern Ireland. Two days after the Massereene Barracks shooting, PSNI officer Stephen Carroll was shot dead in Craigavon, County Armagh. This was the first killing of a police officer in Northern Ireland since 1998. The Continuity IRA claimed responsibility for this shooting and stated that "As long as there is British involvement in Ireland, these attacks will continue". The morning after the attack, worshippers came out of St Comgall's Church after mass and kept vigil near the barracks. They were joined by their priest and clerics from the town's other churches. On 11 March 2009, thousands of people attended silent protests against the killings at several venues in Northern Ireland. The killings were condemned by all mainstream political parties in Northern Ireland, as well as the Irish government, the United States government and Pope Benedict XVI. Sinn Féin condemned the killings, but was criticised for being less vehement than others in its condemnation. First Minister Peter Robinson suggested that the shooting was a "terrible reminder of the events of the past" and that "These murders were a futile act by those who command no public support and have no prospect of success in their campaign. It will not succeed". Deputy First Minister Martin McGuinness said "I was a member of the IRA, but that war is over now. The people responsible for last night's incident are clearly signalling that they want to resume or restart that war. Well, I deny their right to do that." He later stated that the shooters of the PSNI officer killed two days later were "traitors to the island of Ireland". Sinn Féin President Gerry Adams condemned the shootings, saying that those responsible had "no support, no strategy to achieve a United Ireland. Their intention is to bring British soldiers back onto the streets. They want to destroy the progress of recent times and to plunge Ireland back into conflict. Irish republicans and democrats have a duty to oppose this and to defend the peace process". British Prime Minister Gordon Brown visited the scene of the attack on 9 March 2009 and met political leaders in Northern Ireland to urge a united front in the face of the violence. He stated that "The whole country is shocked and outraged at the evil and cowardly attacks on soldiers serving their country" and also that "No murderer will be able to derail a peace process that has the support of the great majority of Northern Ireland". Taoiseach Brian Cowen said "A tiny group of evil people can not and will not undermine the will of the people of Ireland to live in peace together. Violence has been utterly rejected by the people of this island, both North and South". At a press conference on 25 March 2009, Richard Walsh, the spokesman for Republican Sinn Féin, a party linked to the Continuity IRA, said the killings were "an act of war" rather than murder. "We have always upheld the right of the Irish people to use any level of controlled and disciplined force to drive the British out of Ireland. We make no apology for that". He also described the PSNI as "an armed adjunct of the British Army". Brian Shivers, a cystic fibrosis sufferer, was charged with the soldiers' murders and the attempted murder of six other people. He was also charged with possession of firearms and ammunition with intent to endanger life. He was arrested in Magherafelt in July 2009. In January 2012 Shivers was convicted of the soldiers' murders, but Duffy was acquitted. In January 2013, Shivers's conviction was overturned by Northern Ireland's highest appeals court. A May 2013 retrial found Shivers not guilty. He was cleared of all charges and immediately released from jail. The judge questioned why the Real IRA would choose Shivers as the gunman, with his cystic fibrosis and his engagement to a Protestant woman. Brian Shivers has suffered the horror of having been wrongfully convicted in what now must be described as a miscarriage of justice. He was convicted of the most serious charges on the criminal calendar. He was sentenced to a life term imprisonment, which would have seen him die in prison. The original conviction was overturned on a narrow legal basis. It was only during his re-trial that important new material was disclosed which completely undermined the case against him. This failed prosecution – another failed prosecution – is a cautionary tale against the reliance upon tenuous scientific evidence in high profile criminal cases. ^ "Two British troops killed in N. Ireland". CNN. 8 March 2009. Archived from the original on 11 March 2009. Retrieved 8 March 2009. ^ a b c "Murdered soldiers' bodies flown home from Northern Ireland without ceremony". The Daily Telegraph. Retrieved 16 March 2012. ^ "Colin Duffy claims strip-search 'abuse&#039". Retrieved 16 March 2012. ^ ">Northern Ireland PC Murder: Second Man In Court Over Stephen Carroll Killing – Sky News". Retrieved 16 March 2012. ^ "Two British soldiers killed in Northern Ireland attack". Reuters. 8 March 2009. Retrieved 8 March 2009. ^ a b Nikkhah, Roya (8 March 2009). "Two killed in attack on Antrim Army base in Northern Ireland". The Daily Telegraph. London. Archived from the original on 12 March 2009. Retrieved 8 March 2009. ^ a b c "Two soldiers shot dead in attack on Antrim barracks". The Irish Times. 8 March 2009. Retrieved 8 March 2009. ^ "Pizza delivery men among wounded in Northern Ireland terrorist attack". The Belfast Telegraph. 8 March 2009. Archived from the original on 30 July 2009. Retrieved 8 March 2009. ^ "Terrorists murder Ulster policeman (para 7)". The Scotsman. 10 March 2009. Archived from the original on 30 July 2009. Retrieved 5 July 2009. ^ "How the barracks attack unfolded". BBC. 8 March 2009. Archived from the original on 9 March 2009. Retrieved 8 March 2009. ^ Booth, Jenny; Evans, Michael; Sharrock, David (9 March 2009). "Army names Sappers killed in Ulster attack and defends guards who did not fire back". The Times. London. Retrieved 9 March 2009. ^ "Army attack 'brutal and cowardly'". BBC. 9 March 2009. Archived from the original on 9 March 2009. Retrieved 9 March 2009. ^ "Pole Wounded in IRA Attack". Krakow Post. 9 March 2009. Archived from the original on 9 April 2009. Retrieved 9 March 2009. ^ "PM Brown in terror summit in wake of RIRA double murder at Massereene". The Belfast Telegraph. 9 March 2009. Archived from the original on 30 July 2009. Retrieved 9 March 2009. ^ "Real IRA Group 'Claims Army Barracks Attack'". Sky_News. 8 March 2009. Archived from the original on 11 March 2009. Retrieved 8 March 2009. ^ "Two die in 'barbaric' Army attack". BBC News. 8 March 2009. Archived from the original on 10 March 2009. Retrieved 8 March 2009. ^ "Two men held over PSNI murder". Archived from the original on 30 July 2009. Retrieved 10 March 2009. ^ "'Standing in silence for NI peace'". BBC News. 11 March 2009. Archived from the original on 14 March 2009. Retrieved 11 March 2009. ^ "Taoiseach says tiny, evil group will not undermine peace". The Irish Times. 9 March 2009. Retrieved 9 March 2009. ^ "British prime minister visits scene of Co Antrim killings". The Irish Times. 9 March 2009. Retrieved 9 March 2009. ^ "Real IRA was behind army attack". BBC. 8 March 2009. Archived from the original on 10 March 2009. Retrieved 8 March 2009. ^ a b "'Real IRA was behind army attack'". BBC News. 8 March 2009. Archived from the original on 9 March 2009. Retrieved 8 March 2009. ^ "'McGuinness: 'These people are traitors". BBC News. 9 March 2009. Archived from the original on 11 March 2009. Retrieved 9 March 2009. ^ "Sinn Féin's Gerry Adams Condemns NI Shootings". Sky News. 8 March 2009. Retrieved 8 March 2009. ^ "Two U.K. Soldiers Killed in Northern Ireland Attack". Bloomberg. 8 March 2009. Retrieved 8 March 2009. ^ "Two British soldiers shot dead in Antrim". RTÉ News. 8 March 2009. Archived from the original on 30 July 2009. Retrieved 8 March 2009. ^ Sharrock, David (26 March 2009). "PC's killing an act of war, not murder, says Republican Sinn Féin". The Times. London. Retrieved 8 March 2009. ^ "Police Under Attack After Antrim Arrests". Independent Television News. 15 March 2009. Archived from the original on 30 July 2009. Retrieved 5 July 2009. ^ "Duffy Rearrested after High Court Judge overturns detention ruling". The Belfast Telegraph. 26 March 2009. Archived from the original on 30 July 2009. Retrieved 5 July 2009. ^ O'hara, Victoria (27 March 2009). "Colin Duffy in DNA link to soldiers' killings, court told". The Independent. London. Archived from the original on 30 July 2009. Retrieved 5 July 2009. ^ "Man charged over soldier murders". BBC. 27 March 2009. Retrieved 5 July 2009. ^ "Duffy says DNA was planted in getaway car". Raidió Teilifís Éireann. 1 January 2012. Retrieved 21 January 2012. ^ "Man convicted of murdering UK troops wins appeal". Associated Press. Retrieved 15 January 2013. ^ "Shivers not guilty of Massereene barracks murders". Raidió Teilifís Éireann. 3 May 2013. Retrieved 3 May 2013. ^ "Reaction to Brian Shivers verdict". BBC. 3 May 2013. Retrieved 3 May 2013.